This time last year, I was at Chrome Dev Summit. I ran into Jason Grigsby, who I am always glad to chat with. He mentioned, slightly off-hand, that he was writing a new book about Progressive Web Apps and jokingly suggested that I would be a good person to contribute to a foreword. His wonderful new book is out now, published by A Book Apart. A real book made of trees! The foreword is written by myself and Alex, and we mean every word we say in it. 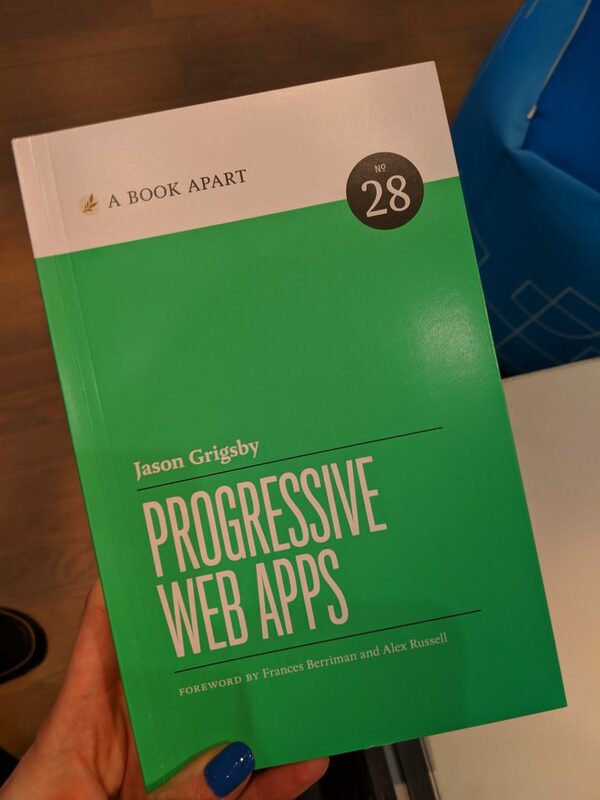 We couldn’t be happier with how Jason’s book turned out and it’s really the only book you need if you want to understand why, and how, you should be building PWAs. I’m very thankful for his kindness and the opportunity to contribute in a tiny way to his amazing work. For the last year, I’ve been writing monthly for the Pastry Box Project, along with 30 other folks of the web. We’re rather cutely referred to as “bakers”. I’m all done now, and you can see all the posts I’ve written here. “UX” as a single person’s role strikes me as a red herring. User experience is everyone’s job to get right — from making sure servers respond quickly to having buttons that seem tangible and copy that’s understandable. “Good UX” should be a core competency within every team member. I contributed a small thought along the same lines for the She Said It advent calendar – a set of uplifting and optimistic pieces of advice from a selection of web people without a Y chromosome to newer designers and developers. You can see mine here.